Hey Sp42, welcome to the hobby, and welcome to LPF. What are you studying/working towards a career in? You mentioned being fascinated by lasers, and it being time to get one for yourself. What made you decide to jump into the hobby, and is there something about the blue band specifically that appeals to you? Thank you for posting an introductory thread about yourself. Most people don't do this and we appreciate your effort. Hope this place can give you what you are looking for. You should be able to find a 1.6 to 2 watt 445nm laser fairly inexpensively as these diodes have been available for years and the price has been coming down on them steadily. You might want to look into getting one built for you by a forum member. Good luck. Thank you for making an intro thread, much appreciated. This is the place to be for laser info, there are many knowledgable members here who can help, and there is also the search function where there are many answers to your questions. I am glad you mentioned laser safety glasses, many new members don't grasp the importance of eye protection however it's the 1st thing most of us reach for and a very good habit, an innocent mistake can happen in a flash and could cost a lifetime of disability save for wearing the safety glasses. Here's what many here buy and wear, yes there are cheaper Chinese glasses on ebay ( Not recommended ) and much more expensive glasses available too, but these are good quality at a reasonable price . I am studying marketing and finance. And since I am close to finishing I have more time (and money) to spend, so I figured it was the right time. And I guess blue simply because it’s my favorite color. That would be awesome. Hopefully after diving into the sale/buy/trade section I’ll be able to find someone that can help me with that. If you happen to know anyone that would be willing to do that, as well as make some extra cash, make sure to send them my way. I’d really appreciate it. Its funny you posted that link. After doing a little research in the safety section I started looking into getting the OD5’s. Do you think those would work for a 445-450nm 1-2w laser? mention buying Laser Safety Googles/Glasses. Welcome to the forum, I am from LA too. What are you looking for in a laser? Are you looking for a burner or something that will make a nice circular dot at long distance? Looking for a blue burner and a green star pointer. Got any suggestions? I give that 'intro' 5 stars!! we need new members from there---we lost a few. I heard the the SCALLEM and the CALEM were super. Any gatherings of like-minded folks, IMO, is a legal LEM. SELEM needs to be on everyone Bucket list. IT goes on for 5 days- happens mid Aug in Newton N.C. If Sp42 helps to get the LEMs back and he comes to SELEM I promise to make a CALEM. for a green star buy from a member like Alan- he sells at ebay under name blab1391- he uses a faster shipper and tests well before sending- a green (18650 batt) is less than $8 -- he has two styles --I have the black 300 and will get the other one. Oh- yu should get th other one- as the black has a mometary on/off-- the better one AFAIK has a click on click off switch- prolly better for star pointing---& plenty of power!! You will have no probs getting a blue burner- buy that from one of the many builder /members who makes then and lives in LA-- or near. Nothing beats buying in person. I would love to be able to go to SELEM. If somehow I can make it out to North Carolina I will for sure go. But even if I am not able to make it.. i think starting a SCALLEM or CALEM sounds like a pretty amazing idea to me. I’ll help in any way to make it happen. And thank for the tips. 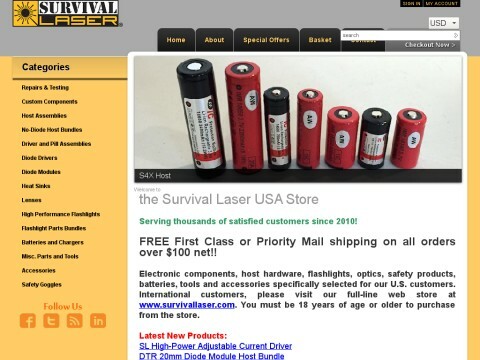 Ill most definitely be buying one of Alan (blab1391)’s click on click off green lasers. Also I’ll make sure to post on the (buy sell & trade) section for that blue burner. Know anyone in particular that you recommend? If not it’s fine I’m sure I’ll have no trouble finding someone.